California Air Districts - Although California has some of the toughest wood burning regulations in the country, many California Air Districts have determined that the HearthCAT Fireplace Technology can legally be installed in existing wood burning fireplaces as a retro-fit device to reduce wood smoke and particulate pollution. Clear Skies is now selling and installing HearthCATs in homes throughout California and across the country. Be ready for this coming winter . . . with the "Award Winning" HearthCAT Wood Burning Fireplace Technology. The HearthCAT is also approved for installation in many other air districts nationwide. See additional information. The HearthCAT Fireplace Technology has been successfully tested in masonry fireplaces including new construction and retro-fits. HearthCAT has also been successfully tested in Isokern Modular Masonry fireplaces and FMI factory built fireplaces. All test results are consistently below the EPA Phase II Qualification threshold of 5.1 g/kg. The HearthCAT is also approved by many of the air districts in California for retro-fitting existing wood burning fireplaces. See additional information. The HearthCAT Fireplace technology has unlimited application potential since it can be used in new construction or fireplace retrofits, and in both masonry and low mass fireplace designs. The HearthCAT™ is approved for retro-fit applications in most of the major air districts in California. It is a passive catalytic device that employs a smoke capture hood to isolate and destroy the offensive pollutants and wood smoke. The system is easily installed, requires no maintenance, and is affordable to the consumer. See additional information. The HearthCAT Emission Control Technology is a patented catalytic system designed especially for wood burning fireplaces. The HearthCAT is positioned directly above the fireplace grate against the back wall of the firebox. The HearthCAT Hood captures the smoke and particulates while most of the dilution air bypases the hood and travels up the primary flue system. The HearthCAT™ System provides secondary ignition for the combustibles before they leave the firebox as harmful particulate pollution. The direct flame on the catalytic surface actually cleans the combustors. The HearthCAT System creates a clean wood burning fireplace. This is the only passive technology available for emission control of wood smoke emissions from fireplaces. See additional information. Over the past year, Clear Skies Unlimited has been recognized for various technology awards. However, the 2009 Clean Air Excellence Award from the Environmental protection Agency EPA is the most gratifying. On May 26th 2010, the US Environmental Protection Agency recognized Clear Skies Unlimited for its dedication to excellence in achieving clean air at the annual EPA Clean Air Excellence Awards. As this year's award winner, Clear Skies was recognized by EPA for outstanding accomplishments in improving air quality and reducing particulate emissions. The ceremony was held in Washington, D.C. The Clean Air Excellence Awards recognize and honor outstanding, innovative efforts that make major progress in achieving cleaner air. The awards were established in 2000, at the recommendation of the Clean Air Act Advisory Committee (CAAAC), a senior-level policy group that advises EPA on implementing the Clean Air Act. After considering hundreds of potential candidates, the award went to Clear Skies Unlimited based on the projected impact that the HearthCAT Technology will have on future wood burning fireplace emissions nationwide. See additional information. Reno NV - For four consecutive years, Hearth & Home Magazine had issued the Vesta Challenge to hearth product manufacturers for the creation of a low emission, wood-burning fireplace retrofit technology. For the first three years, the challenge had not been met. Again in 2009, Hearth & Home challenged the hearth industry to develop a retro-fit technology that would dramatically reduce particulate emissions in wood-burning fireplaces without creating any smoke spillage or adversely affecting indoor air quality. On Friday, March 20th in Reno, when the Annual Vesta Awards were held at the 2009 HPBA Expo, a winner of the coveted Vesta Challenge Award was finally announced. Was the successful company a major fireplace manufacturer with an unlimited R&D budget? No! The winner was a small technology company from Albuquerque, NM, Clear Skies Unlimited Inc. Conclusive test data indicates that HearthCAT Fireplace Technology from Clear Skies reduces particulates in open hearth masonry fireplaces by 70% and provides emission reduction in low mass fireplaces by almost 90%. The award was presented to Clear Skies Unlimited by Mr. Gilbert Wood from the US Environmental Protection Agency US EPA. The HearthCAT System was tested at Omni Test Laboratory in Portland OR. The Omni test report was submitted to a panel of judges for review as part of the Vesta procedure. 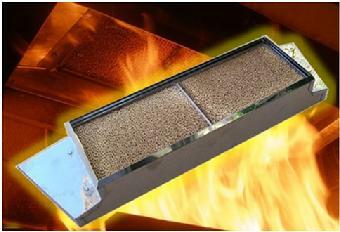 The HearthCAT Fireplace Technology reduced particulate emissions in an open hearth masonry fireplace to 3.2 g/kg. This technology has application potential in millions of fireplaces nationwide. The manufacturer projects an installed cost of $500 per unit. See additional information. The ASTM and US EPA, working with the Hearth Products Association HPBA has established a Performance Specification for woodburning fireplaces. ASTM E-2558 has been accepted as the industry standard for emissions testing of woodburning fireplaces under the auspices of ASTM. OMNI-Test Laboratories, Inc. specializes in woodburning emissions, air quality engineering and sampling methods research. OMNI was at the forefront of state and federal emissions standards development and is the premier laboratory for testing woodstoves and fireplaces for conformance with new safety and emissions standards. The HearthCAT Emission Control System was tested extensively at Omni-Test Laboratories in Portland, OR. All emissions testing was performed to ASTM E-2558 Annex for Masonry Fireplaces. The HearthCAT System consistently reduced particulates by an average of 70% or more. The performance results of the HearthCAT are very impressive. This fireplace emission control technology allows for high flow rates without developing back pressure while significantly reducing particulate emissions in all types of open hearth fireplaces. Test data has been submitted to the US Environmental Protection Agency. Copyright © Clear Skies Unlimited. All rights reserved. Unless otherwise indicated, all materials on these pages are copyrighted by Clear Skies Unlimited Inc. All rights reserved. No part of these pages, either text or image may be used for any purpose other than as personal reference material. Therefore, reproduction, modification, storage in a retrieval system or retransmission, in any form or by any means, electronic, mechanical or otherwise, for reasons other than for personal reference, is strictly prohibited without prior written permission. The identifier "Clear Skies Unlimited" refers collectively to Clear Skies Unlimited Inc. and its affiliate companies. See additional information. Please click on the Icon to the right to request HearthCAT information from Clear Skies Unlimited. 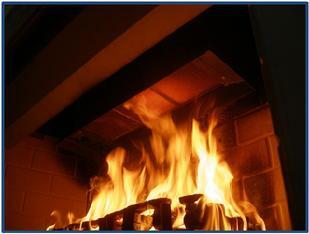 We are preparing a catalog that covers all of our woodburning fireplace emission control products. Thank you for your interest in our products.